March 16, 2019 Robert W.
Wholesale advertising flyer printing is available in the Las Vegas area. There are a couple of major printers in Las Vegas that do wholesale advertising flyer printing locally that offer substantial discounts from a local printer. These very large print shops use million dollar printers that can print flyers, brochures and postcards are amazing speeds with the highest quality. This savings is passed on to the end user. Wholesale advertising flyer printing is being used extensively with retailers in Clark County. Smart businesses are using flyers as a marketing method to communicate with their clients at a very low cost. Las Vegas stores are including a coupon in the purchase bags offering a discount on their next visit and the customers are retaining these coupons and redeeming them in the stores at a high rate. his is especially true for take out restaurants in local areas. The take out restaurant realizes that the majority of his customers live in the community. By placing flyers in their take out bags, they can put their menu and contact information in front of the customer and try to lure them back to the restaurant for more food. In fact, local take out restaurants have went a further step and distribute flyers to the neighborhood in trying to obtain more customers. The full color flyers are cheap enough, with 5,000 1/2 page flyers costing around one hundred sixty dollars. Passing out 2,000 – 3,000 flyers in the neighborhood will bring a substantial amount of business. In fact, one local take out place recently dedicated a chicken wing Wednesday and offered great deals on chicken wings only to bring people into the store. Wholesale advertising flyer printing is something you can take advantage of and profit off of. Flyers are a cheap way to market to customers and will bring you many positive results. March 3, 2019 Robert W.
Las Vegas cheapest half page flyer printing is available at great discounted prices to the public and businesses. Half page flyers are one of the most popular size flyers that are used. by businesses today. The 5.5″ x 8.5″ seems to be the right size that can contain a lot of information about a businesses or event. These half page flyers are printed on a 100lb paper in either matte or gloss and can be full color, meaning you can print as many colors on the flyers as you like as well as pictures and backgrounds. Las Vegas cheapest half page flyer printing can get those flyers printed at a cheap price. Las Vegas cheapest half page flyer printing is great for fast food and take out restaurants where you like to give the customer a flyer with every order. By placing a flyer inside the take out bag or stapling it to the take out food bag, you keep your food fresh in the mind of your customers. Plus, most people will keep a take out flyer if it has a food coupon on it for their next purchase. The residual rate for repeat customers is very high when these simple flyers are given to your customers. Half page flyers are also used for promotional purposes. Many entertainment venues will use the half page flyers as a marketing method to reach out and contact tourists in Las Vegas. Many tourists will walk Las Vegas Blvd.. while they are here looking around and looking for something to do. Promoters will come along and pass out flyers to these tourists in hopes of getting them interested in hot air balloon rides, helicopter rides Grand Canyon tours, etc. The flyers are cheap and inexpensive and are a old school way of marketing to people that still works today. February 19, 2019 Robert W.
Las Vegas cheapest flyers and postcards can get you wholesale flyers, postcards, brochures and other printing cheap. Why should you have to pay retail when there are two very large printers in Las Vegas supplying flyers and postcards at discount prices to print stores that just raise the price and make lots of money ! Las Vegas cheapest flyers and postcards are available to everyone. Las Vegas cheapest flyers and postcards are quality prints. They are printed at state of the art facilities that supply all of Las Vegas and around the country with printed materials. The flyers are printed on 100lb paper, both sides and come either with a glossy finish or a matte finish. The flyers come in many different sizes to accommodate your needs. The postcards are printed on a 14pt card stock on both sides and can either come with a glossy or matte finish. EDDM postcards can also be printed in the popular 6″ x 9″ size. Las Vegas cheapest flyers and postcards are great for trade shows and conventions where thousands of people attend and a lot of printed literature is handed out to interested parties in your products. Many businesses prefer to have their printed materials made in Las Vegas for simplicity. There is no shipping or worry about lost material. The flyers and postcards can simply be picked up or delivered to your hotel. Businesses in Las Vegas also like the cheap postcard and cheap flyer printing because they can use them for coupons and store promotions. Many fast food restaurants in Las Vegas will staple a flyer with a printed menu on it or a postcard to the take out bag or slip inside a flyer to promote the next purchase of their food. Fast food restaurants have tremendous success with this type of advertising. Why pay retail when you can get custom printed flyers in Las Vegas wholesale ! Las Vegas inexpensive custom flyers is available to both businesses and private parties. Las Vegas inexpensive custom flyers can get you printed those custom designed 1/4 page, 1/2 page and full page flyers in color. These flyers can include pictures, backgrounds, logos and just about anything that can be printed. Las Vegas inexpensive custom flyers are quality printed flyers, just at a discount. Club Promoters in Las Vegas love cheap flyers as they and their associated pass out thousands of flyers a week to the tourists that are walking along Las Vegas Blvd in front of the major casinos. marketing to the tourists is a difficult job, so local promoters hire young, attractive women to walk up and down the street in front of the casinos talking to people about how great a night club is or some other entertainment venue. If the tourists seem interested, the young women hand out a flyer with instructions on how to get the club and a discount coupon of some sort. When the coupon is turned in, the promoter gets an additional bonus for every person they referred. The young women pass these flyers out by the hundreds every night in order to fill the night clubs. Las Vegas inexpensive custom flyers are also well liked by the vendors and businesses that come into Las Vegas to display their goods and services at the trade shows and conventions. They can order their cheap flyers and cheap postcards in Las Vegas locally and then hand them out to the people attending the events and shows. The vendors can pass out thousands of flyers at the bigger convention and trade shows and purchasing cheap flyers will save them money. Picking the flyers and postcards up locally saves shipping costs and inconvenience. February 18, 2019 Robert W.
Las Vegas custom flyer printing is available locally at very cheap prices. Why pay retail prices when you can save a lot of money and get cheap custom flyers printed in Vegas. Las Vegas custom flyer printing gets you high quality, low priced flyers at a discount. How is this possible ? In Las Vegas, there are a few very large printers that sell wholesale to sign shops and print shops. We simply offer you a lower profit margin and sell the custom made flyers to you at a discount. These flyers are printed on 100lb paper, both sides and can be coated with a shiny coating or you can have them plain matte. The flyers are full color prints, meaning you can have an array of colors printed on them along with pictures and logos. That means unlimited colors on your flyers! Las Vegas custom flyer printing is great for trade shows and conventions. Vendors and businesses can order their cheap custom printed flyers and cheap postcards and get them at the cheapest price and just pick them up when they come into town. This saves on shipping costs and lost materials, which happen a lot in Vegas when the big conventions come into town. Orders get mixed up and get lost and then everybody scrambles at the last moment for replacing the lost printed material. Las Vegas custom flyer printing is cheap and you can get the cheapest prices in Las Vegas. The cost of 5,000 1/2 page flyers printed on both sides is around one hundred sixty dollars and 5,000 full page flyers 8.5″ x 11″ costs less than three hundred dollars. These are for full color , two sided flyers printed on 100lb paper. Contact your favorite sign store or printer and see how much you can purchase these cheap custom printed flyers for. Inexpensive flyer and postcard printer in Las Vegas can get cheap flyers and cheap postcards printed for you at a savings ! There are a few very large wholesale printers in Las Vegas offering postcards, flyers, brochures, door hangars and more to the public at great pricing. Inexpensive flyer and postcard printer can save you money ! Cheap postcards and cheap flyers are a great old school way of getting information to your customers. Several businesses in the Las Vegas are using these printed materials with great success. There is a hamburger café in the are that has been using flyers for about 6 months now with great success. the café distributes flyers and postcards to approximately 3,000 homes surrounding there café advertising food specials. They have made Wednesday ” chicken wing Wednesday” and always advertises that special along with his other food on there flyer. Customers are lining up on Wednesday since they found out about his special and they sell several hundred pounds of wings every Wednesday. In addition, his sales have gone up on all there other food as well. They distribute the flyers every two weeks to remind people as well as get the new neighbors in the area attention. After all, this is Vegas and people come and go into a neighborhood constantly. Considering only 10,000 flyers are around three hundred dollars, you can see that it is a great low cost approach to marketing the business. They use employees and their children to distribute the flyers at a very low cost. With every take out order, they include a flyer menu or staple it to the take out bag. Inexpensive flyer and postcard printer can get you these flyers and postcards very cheaply. Contact a local printer or sign shop and see how old school marketing with flyers and postcards can help your business. Low cost flyers is a great old school way of marketing your company. In these hard economic times, many companies and businesses in Las Vegas are turning to low cost flyers as a way of getting the message out to people about their businesses. For example, tax preparers will use low cost flyers to pass out to people in certain communities to market their tax preparation. In addition, tax preparers will go to the Las Vegas outdoor swap meet and rent a spot and pass out flyers to people walking through the swap meet. This not only gives them a chance to talk to people / clients, it also allows them to hand out a flyer to remember who they are. Low cost flyers are also used by promoters and passed out to tourists that are walking along and sightseeing on Las Vegas Blvd. in front of the casinos. Promoters will hire good looking women to hand out flyers to tourists who are looking for something to do other than gambling. The cute women will talk to tourists and tell them about a night club that is full f fun and then give them a flyer with a coupon on it and directions to the club in order to entice them to go there. These girls will talk to hundreds of people a night and hand out hundreds of flyers in hopes of getting some of these people to go the club. The girls will get paid bonuses for how many people they an get to go the club. Since they pass out so many flyers a night, cheap flyers is a plus. Low cost flyers is open to anybody, businesses, non profit organizations and just ordinary people. There are several large printers in Las Vegas that will sell directly to the end user. 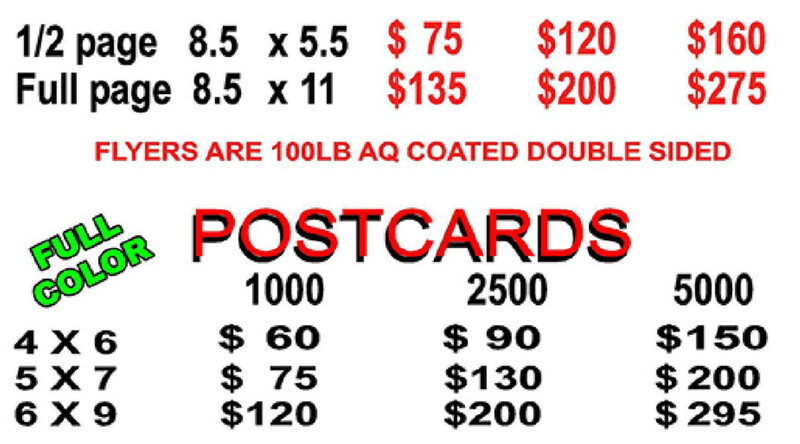 Bargain priced flyers and postcards can get you wholesale pricing on your favorite sized flyers and postcards. Whether you are looking for 1/4 page flyers, 1/2 page flyers, 4x 6 postcards, 5 x 7 postcards, it does not matter. Bargain priced flyers and postcards can be found in Las Vegas at great pricing. There are many uses for flyers and postcards and local businesses are taking advantage of these and doing some old school marketing. Take out restaurants love flyers because they are cheap and easy to distribute. Every Chinese take out place and Italian pizza place I know always puts a flyer or staples a flyer on the bag so that you have a menu available next time you order food. That flyer distribution results in more sales and more profit. In addition, local restaurants will have 2,000 flyers or postcards printed and then have them distributed to the surrounding homes in a mile radius on a regular basis to support sales consistency. The restaurant will simply have kids or employees place these flyers on every door in the community. By doing so, the flyer has a much better chance of being seen than by mass mail that is always cluttered. Bargain priced flyers and postcards are also enjoyed by trade shows and conventions. Vendors coming into town to display at these events are always looking for cheap flyers and postcards to hand out to customers at the convention venues. it easy and comfortable to just order the printed materials in Las Vegas and then simply pick them up or have them delivered to their hotel. It saves on shipping the materials into Las Vegas and the headaches of lost shipments which occur quite frequently during the convention season. Bargain priced flyers and postcards can increase your business. Orders yours today from your local printer or sign store.